I actually like it! The printed distances is really clever. For making it really simply (though perhaps too simple), you could make use. * Only exits on the middle of the wall of the room, only one exit on each wall. * No bends or t-sections, intersections on the corridors. IE corridors are straight and lead directly from one room to another room. 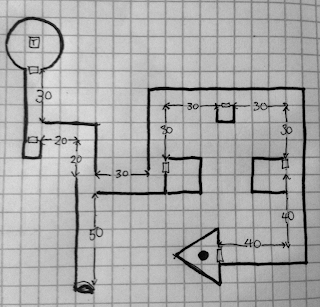 Very simplistic, but you might still be able to make something interesting, as long as you only need to make one or two dungeons with that design. I would actually have the new DM model their first map after a building they're incredibly familiar with - an old apartment complex, their school, a relative's house, and so forth. This familiarity allows the DM to focus on other aspects of the "dungeon" and they're less likely to forget details like how big or small a room is and have a good idea of where all the characters are standing in relation to things, etc. I think it's a great idea overall, but you've made it a bit confusing by not being consistent in what side of the hall you describe. The map itself - very neat. But you immediately use the first hallway in a confusing manner. I would have mapped that wrong already. To me, it's 50' to the first hallway on the right, 10' wide, then 30' beyond that the hall ends in a left turn. I think it'd work better keep the distances on either right or left, or be sure to mention what side you are measuring off of. Just to add, in the groups I've played with, we give distances to the outside of a corner, not the inside, so that's likely part of my confusion. Maybe your default is the opposite. That works, but I will say that my group, which is about 66% newbies (well, by now they're not, but they started that way), love mapping when I run my megadungeon game, the more complex the better. This was quite surprising to me, honestly. I always give distances in terms of how far their torch/lantern/magical light reaches (so they can see the end of a 30' corridor at the edge of their torchlight, frex). I'd only give distances if they took the time to pace things out, which made them more vulnerable to wandering monsters and running out of torches. I do like your idea of notating distances on the map, esp. for long or diagonal corridors. I like the map and esp. the distances written in - very easy on the eyes if not as pretty. There's a small dungeon in BHP's Village of Larm where the corridors continually make right turns in ever decreasing distances and you slowly spiral in towards the center room. Although I hated to see this at first due to the linearity of it, it does force the beginning players and DM (who the module is aimed at) to come to an early understanding about direction descriptions, otherwise their map is quickly going to be looping back over itself. I thought your description example was very clear, but the fact that an experienced player here didn't only shows the complexity of conveying directions that much more, even with the lights turned on here as it were. The whole subject illustrates why some groups prefer to use miniatures with grid maps, although as we've seen this can lead to (some might say "devolve into") a more combat oriented game. With your given qualification, I think you've got an excellent checklist there. The maps of the caves in B2 are a good example, for the most part - there are a few places where the more natural chambers might confuse, but there are clearly marked slopes and everywhere the 45 deg. angle. The underground maps of Moldvay’s B4 are even more basic. @Rubberduck: Door in the middle of the room, yep! I couldn't do it easily on the standard graph paper with a 20' x 20' room. I suppose I could have kicked them up to 30' x 30'. And in an earlier draft the circle/triangle rooms were on the side of their corridors, but I felt, like you, that it was easy for the corridors to terminate in their doors. @R: Interesting idea, I don't know if the buildings in my life would make interesting dungeons, maybe post-apocalyptic gaming . . .
@Koren: Yep, that's why it's good for me to do this, because it clarifies these thing for me. I was struggling with that very aspect of the map. Measuring to the corner makes more sense, but I seem to remember doing it that way made other places confusing? Maybe that little room right before the circular one. How would you describe that? I suppose you just have to make clear to the mapper: "measurements are to the outside of a corner but the inside of a door"? @KenHR: That makes a lot of sense, and I've tried that some, but I think it makes things a lot more difficult, because I'm having to constantly count squares:"Can they see that door yet?" I've thought about having a little circular template that represents light radius and sliding it along the map as the party explores to let me know what they can see. But then you still have a problem of communicating distances; if you don't say 10', 20' 30' feet, what do you say? Close, far? I suppose you could say "Just at the edge of your torch light," etc. @ze Bulette: Thanks for the comment, I'll look back at those modules. Yeah, I've DMed where I just drew what the party saw on a battlemat, and that might be easiest for a brand new DM, but it eliminates all chance of getting lost and any kind of map-confusing dungeon design and trickery that the grognards seemed to love. But maybe that's not such a loss. 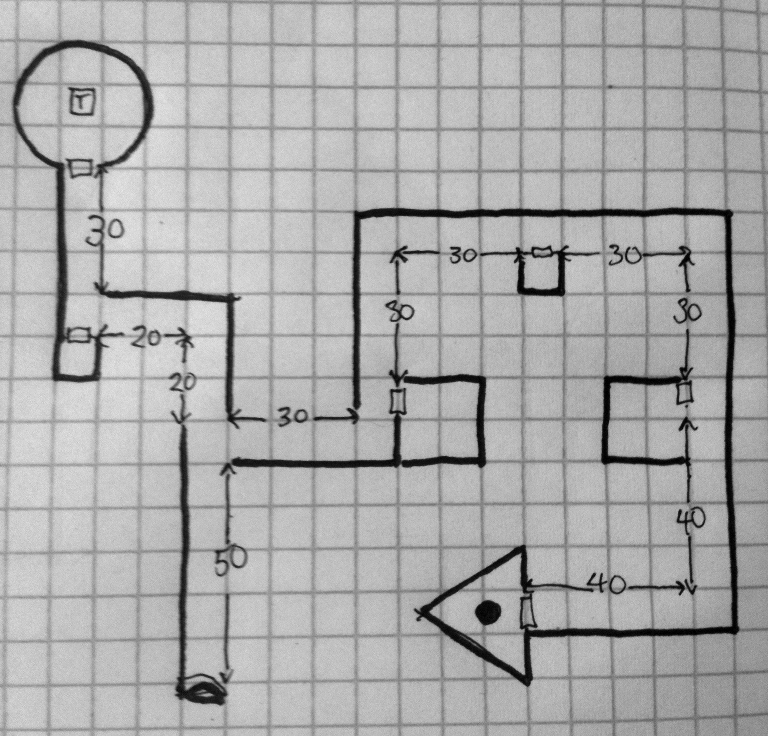 At any rate, I feel I've isolated two important things that need to be worked out between DM and mapper: 1) How are you going to describe distances to doors, 2) how are you going to describe distances to turns. I think this is a great idea. It's solid for both beginners and great for experienced GMs. I think that I could quickly describe the dungeon very quickly with such notations. "I've thought about having a little circular template that represents light radius and sliding it along the map as the party explores to let me know what they can see." I've thought of doing that, too, but it's easier to wing it or abstract everything down to squares. For example, if they're in a 60' square room, I'll say, "The room is pretty large. You can't even see the opposite wall until you've gotten about halfway into the room." "But then you still have a problem of communicating distances; if you don't say 10', 20' 30' feet, what do you say? Close, far? I suppose you could say "Just at the edge of your torch light," etc." I use the "just at the edge of your torchlight" method. It comes down to the same thing, eventually, as reading off distances, but it's a bit more evocative. Cool idea... counting squares is annoying even when you don't make a mistake. I think I'll try scaling my maps so that the base of my favourite coffee mug is the area illuminated by a torch.